Computational Science is a rapidly growing multi- and interdisciplinary field that uses advanced computing and data analysis to understand and solve complex problems. It has reached a level of predictive capability that now firmly complements the traditional pillars of experimentation and theory. The recent advances in experimental techniques such as detectors, on-line sensor networks and high-resolution imaging techniques, have opened up new windows into physical and biological processes at many levels of detail. The resulting data explosion allows for detailed data driven modeling and simulation. This new discipline in science combines computational thinking, modern computational methods, devices and collateral technologies to address problems far beyond the scope of traditional numerical methods. • Computer and information science that develops and optimizes the advanced system hardware, software, networking, and data management components (e.g. problem solving environments). The Journal of Computational Science aims to be an international platform to exchange novel research results in simulation based science across all scientific disciplines. It publishes advanced innovative, interdisciplinary research where complex multi-scale, multi-domain problems in science and engineering are solved, integrating sophisticated numerical methods, computation, data, networks, and novel devices. 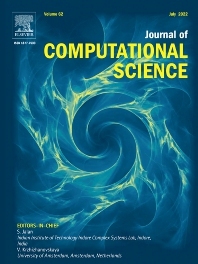 The journal welcomes original, unpublished high quality contributions in the field of computational science at large, addressing one or more of the aforementioned elements.